Fiji coach John McKee has emerged as the favourite for the dual coaching role of the Japan ­national team and the new Japanese Super Rugby franchise. It is understood McKee is on Japan’s short list of candidates and is regarded as a strong chance to secure the job, but a final decision is yet to be made. The Fijians have performed credibly under McKee at the World Cup in England, giving the host nation, the Wallabies and Wales a run for their money. McKee’s assistant coach at Fiji, South African Frans Ludeke, who guided the Bulls to back-to-back Super Rugby titles in 2009 and 2010, is also set to join him in Japan. McKee would replace former Wallabies coach Eddie Jones, who has guided Japan to upset wins against South Africa and Samoa at this World Cup. Jones was originally intended to be the director of coaching of the Japanese Super Rugby team, to be called the Sunwolves, but he stepped down to accept an offer from the Stormers. A New Zealander, McKee has had a varied coaching career with European clubs Montferrand, Connacht and Cornish Pirates as well as the Central Coast Rays in the defunct Australian Rugby Championship and the Australian Under 20s. McKee was an assistant coach of the Pacific Islands and a technical adviser to Tonga before taking on the head coaching role of Fiji last year. In McKee’s first match in charge, Fiji upset Italy 25-14 in their first win against a Tier 1 nation since their 38-34 win over Wales in the 2007 Rugby World Cup. McKee guided Fiji to victory in the Pacific Nations Cup this year, where they beat Tonga 30-22 and Japan 27-22, while also drawing with Samoa 30-30 before beating the Samoans 39-29 in the final. Japan’s performance at the World Cup has encouraged SANZAR to believe the Japanese Super Rugby franchise will be competitive, with most of the national squad expected to be recruited. “Japan has had their most successful World Cup ever with two wins and one game to go (against the US) and set the whole competition alight with their win against South Africa,” SANZAR acting chief executive Brendan Morris said. 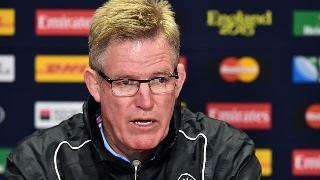 “It has bene extremely pleasing from a SANZAR perspective to see how competitive they have been on the world stage. “One of the reasons our national teams are so successful on the world stage is because of the intensity of and competitiveness of Super Rugby that prepares our athletes better than any other competition in the world for the rigours of international rugby. “Seeing Japan compete at that level has been very pleasing to us. ← Happy National Noodle Day! !